-I have no interest in reading THR’s Kardashian cover story, but I did like this accompanying bit from a branding expert on how the family redefined the business of celebrity. –Casey Affleck may have just confirmed what we all suspected: that Ben Affleck is not returning as Batman. -Have you noticed that there are a lot less photos of stars at the airport lately? That’s because LAX installed a VIP terminal that’s paparazzi-free. 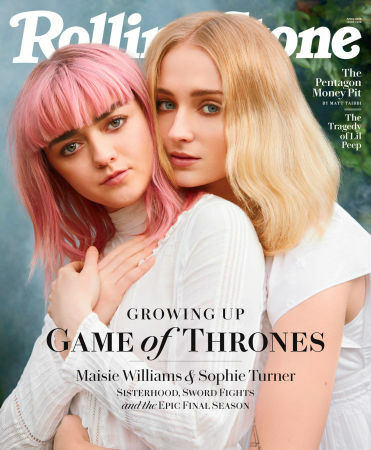 -Game of Thrones stars Maisie Williams and Sophie Turner tackle Miley Cyrus and Justin Bieber in next episode of Carpool Karaoke, and the preview is all kinds of adorable. -Another episode of Game of Thrones Season 7 leaked early. The kicker? This time, the breach came from an HBO affiliate. -Is Drake opening a new restaurant in Toronto? Has he learned nothing from Fring’s? –Chris Hemsworth says he was “weirdly shaken” when he first met Chris Pratt because “he’s just so charismatic.” Celebs: they’re just like us! -Why does The Mindy Project insist on doing this terrible storyline over and over? -I don’t watch Suits, but I support any show that gives Gina Torres her own spinoff. -Girls Trip’s Tiffany Haddish remains the best talk show guest. -Late night shows were on fire last night. Colbert’s blow-by-blow takedown of the president’s press conference was merciless — and his team wrote it in less than an hour. Jimmy Kimmel made an outraged plea for Trump supporters to finally abandon their president. Seth Meyers tore up Trump’s “clinically insane” presser. -God, I love Mark Ruffalo. He and Olivia Wilde joined the huge protest outside of Trump Tower last night, where Mark shot some video. –Lisa Rinna tweeted “All lives matter” and then claimed she didn’t really know what that meant. Sigh. -After 16 years, Helen Hunt and Matthew Carnahan have decided to call it quits. -According to Jason Bateman, Arrested Development season 5 production kicks off next week. -That Tom Cruise on-set injury we saw in the leaked video earlier this week was serious; it shut down the Mission Impossible production. –Chris Brown tried to explain his side of the story in his Rihanna beatdown. Keep it. -I also like this Vogue piece with Oprah about how she’s on a roll (again). -Here’s the first trailer for The Killing of a Sacred Deer starring Colin Farrell and Nicole Kidman (featuring a creepy good use of anEllie Goulding song). This film was both booed and applauded at Cannes. It’s from Yorgos Lanthimos, who did The Lobster — a movie I didn’t really understand but still have a strange affection for.